“Sometimes you shouldn’t ask too many questions,” says Ellen Lanyon in response to my insistence that the multitude of magical objects depicted in her paintings must contain some magic charm; otherwise, why paint them ad infinitum, as she has, for the past forty years? Lanyon’s reprove follows with a sideways glance. “It’s better to leave those questions here,” she says in a wise and kindly way, pointing to her temple with a tap of the finger, and signifying that mysteries hold their power quite because they are mysterious. A magic trick explained leaves nothing to the imagination. cidental flourishes of labor’s accomplishment. The antiques also look totally alien to a contemporary eye. Did they really work? Perhaps we just have to take their word for it. Lanyon and I are discussing the quandaries of technological progress in Valerie Carberry’s gallery suite held aloft by the Hancock Tower’s struts of steel beams, itself a marvel of technology. Across town, in Bill Gross’ apartment gallery, Brian Kapernekas is showing new paintings with subject matter that straddles abstraction and representation. Forms such as a bat, an owl, and gray fog cause the eye to slip on perceptual recognition. The trick is intentional. Kapernekas’ rugged application of thick oil paint on a toothy-surfaced linen tells us that the paint itself is an object to be considered in addition to the painting’s content. “Drifter” is a horizontally oriented canvas showing a train’s boxcars passing through a silent, snowy night. Both the boxcars and the snow are composed of simple shapes: blobular white for snow, and parallel black stripes for the freighters. “Drifter” brings to mind one of my favorite expressions: Ships passing in the night. It’s a phrase with dense visual acuity, and you can almost feel the massive stillness of the night. Perhaps the viewer is one ship, and the painting is the other. We recognize each other, but say nothing. Many of Kapernekas’ scenes take place at night: a campfire, the moon reflected in a pond, an owl peeking out from a tree’s hollow. 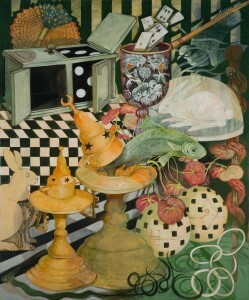 Kapernekas often presents one object per canvas. A shovel, a broom, a crow—each singularly presented—flash like the figures on a tarot deck, and they are ominous. A crow could be just a mangy bird, but it could also be a harbinger of meaning cloaked in dusky feathers. Sometimes such an omen alights on one’s shoulder, and it takes a special attunement to what Rick Moody calls in “The Diviners” “the knowledge of subtle things” to be able to see it. Lanyon, too, employs the help of animals. Frowning fish, recumbent rabbits, butterflies and birds are carriers of deep-seated natural powers. The fauna attends to the magician’s tricks—such parlor games as “The Spirit Bag” and theatrical sets like “The Hindoo Wonder Bowl.” With a sleight of hand and flourish of fingers, things appear and then disappear. Showmanship is no doubt important, especially if one is to cause a birdcage and a revolver to interact, producing a distracting cloud of smoke while a bird is shuffled into a pocket, and relishing a bit neo-Victorian metaphysics: keep hush; the world was made without you. To create “Fog,” Kapernekas took a previously painted colorful landscape and sprayed it with a layer of crisp gray enamel paint. It could very well be a gray monochrome painting, but no, it is dense fog over land and sky, a veil of material behind which exists something and in front of which exists us. Kapernekas describes his paintings as travel narratives, or the record of a journey. They are portals, so to speak, into past occurrences. In other words, painting is a nugget of memory. These travel narratives do not recount a timeline of events, though. Kapernekas is after something a little more outside of time, something natural and mythological and eternal. It’s as if painting is a potion or an incantation, but viewers may not always be privy to the secret language; we can flip through the book of personal iconography, but the captions are conspicuously absent. Lanyon likes this term—personal iconography—for it explains a lot without revealing much. It promises to keep biography under wrap of publicly traded symbols. Lanyon admits to being a political activist, a feminist advocate, and a marcher of protests, and she also admits to rarely, if ever, directly incorporating politics into her painting. This admission opens up a clearing in the forest and invites us to enter an inner sanctum, but beyond, through the veil, we can see only more darkness, and it is staring back at us.